Halloween 2018 left a horrifying mark on San Diego Comic-Con today when some extended footage of Michael Myers killing at random was unveiled. While reactions to the recently released promotional material for the film have been mixed between older and younger horror fanatics, the new Comic-Con footage seems to have bridged the gap and brought both factions together. Unfortunately, the new Halloween footage has not been released online, but we have a pretty good description about what to expect. The new Halloween 2018 Comic-Con footage takes place on the last day of October, which should be pretty obvious. There's kids out trick or treating with their voices echoing around the streets. A group of kids in costume are walking when they suddenly bump into Michael Myers, who then walks past the kids to grab a hammer from a garage. The Shape then walks around in a house, picking up a knife in the kitchen. A woman is in the kitchen, sees him, screams, and then he walks past her dead body. He then peers at a screaming baby in a crib and then walks out of the house. The iconic Halloween theme by John Carpenter now starts to play as Michael Myers finds another house to terrorize. He walks around to a window and stares into it as the camera remains in place as Myers walks around the house only to be seen grabbing a new woman by the hair and smashing her face into the window. The scene then switches to Jamie Lee Curtis with a shotgun. From there, the footage goes on to fill in the backstory for Halloween 2018. Reactions for the Halloween 2018 Comic-Con footage have been extremely positive on social media, with many noting the use of the theme as well as some old school looking gore adding to the vibe. One fan on Twitter mentioned that David Gordon Green is not messing around with this movie. Both Green and Jamie Lee Curtis were on hand at the Hall H panel. To introduce the footage, Curtis noted that what makes Michael Myers so terrifying is "the randomness," which is on full display in the Comic-Con footage. The only people Myers doesn't kill are the kids. Instead, he kills their moms. Fans who were lucky enough to be in attendance for the panel were visibly shaken by what they saw, which means that Halloween 2018 is doing exactly what it set out to do. Michael Myers is out killing at random on Halloween night while little kids are trick or treating and the iconic theme by John Carpenter is playing in the background. What else do you really need? It seems unlikely that the footage shown today will make its way online, and that's probably a good thing. The buzz should get just about anybody who was on the fence about the film in line to buy tickets. While we wait for some more footage, you can check out the latest trailer below, thanks to the Universal Pictures YouTube account. The #HalloweenMovie trailer is OFF THE WALL. Michael has literally never been so terrifying. And I've never been more in love with Laurie Strode. 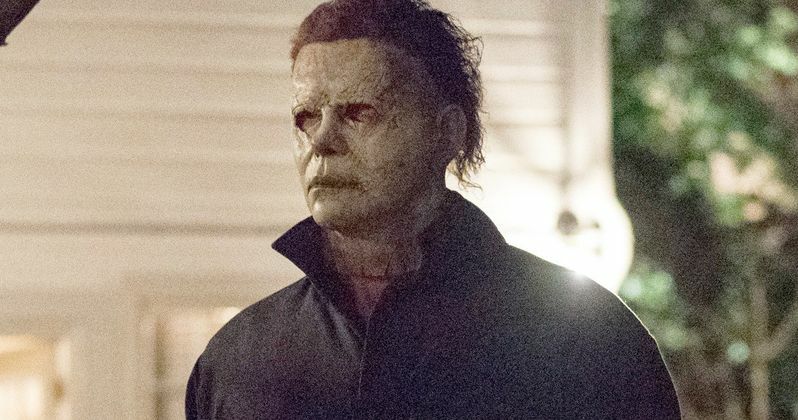 New clip from #HalloweenMovie shows Michael at his most brutal in a stunning tracking shot seeing him entering multiple houses and killing people!